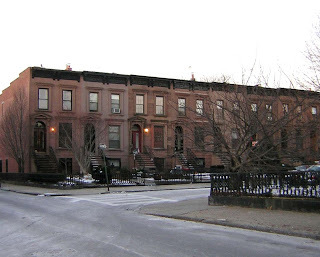 The Carroll Gardens Historic District includes the buildings on President and Carroll Streets between Smith and Hoyt Streets and the western ends of the two blocks between President and First Streets. It includes over 160 buildings and only eight block faces. Historian Frances Morrone in his book, “An Architectural Guidebook to Brooklyn” says that with great foresight, the surveyor, Richard Butts, planned the area with garden setbacks in 1846. Each house is setback behind 33.5¼ feet deep gardens, which have become the area’s signature. Butts’ cleverness is apparent in two ways. 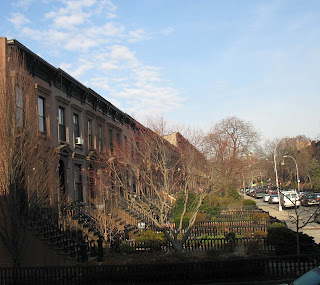 First, the houses are so sited on their lots that they have unusually deep front yards – the “gardens” of Carroll Gardens. Second, he fiddled with the grid in a way one wishes many more developers had done: the east-west streets jag slightly so that houses terminate the vistas along these streets. Butts also planned the area to the south, bounded by 1st Place, Henry Street, 4th Place, and Smith Street with the same setback gardens. (The Carroll Gardens Neighborhood Association is currently evaluating expanding the Carroll Gardens Historic District to include these streets.) Butts’ “Map of the City of Brooklyn and Village of Williamsburgh”, shows blocks of unusual depth. The map indicates that between Henry and Smith Streets, the five streets of Summitt, Woodhull, Rapelje, Cooper and Coles were to be altered to provide for four new streets, First through Fourth Place, that were to be 50 feet wide. Houses on these streets were to have front courtyards 33.5¼ feet deep.